A new urbexer from Wisconsin shares his insights into an exploration of the Stonewall Jackson School. Photo: Cannon Memorial Hall is one of many individual structures that make up the school. On the fringes where rural meets urban outside of Concord, NC is a stone arched bridge that hangs over one of the roads. Ivy has all but covered the exterior of this bridge, but the rusting words “Stonewall Jackson School” are still clearly visible to northbound drivers passing underneath. From the furrow of the road beneath the hedgerow and natural hills can be seen the tops of red brick structures that are common in this part of the state. For those with trained eyes, however, the telltale signs of abandonment are there. Unkept grounds, boarded windows, and a notable lack of human presence permeate throughout this urbex location. This is the site of the Stonewall Jackson Manual Training and Industrial School. The initial inspiration for the school drew from an astonishingly cruel court case witnessed by James P. Cook. In a 1921 article Cook chronicled the unfortunate turn of events for a 13 year-old boy. The boy had been born to an uneducated couple who lived in the Piedmont hills. Disease took his parents and had left him an orphan. With no one else to care for him the boy was taken in by more affluent distant relatives. No effort was made by the boy’s caretakers to improve his lot in life outside of feed and clothe him. One Sunday the boy’s caretakers left him to watch over the property. In their absence the boy went exploring about the house and came upon $1.30 in bureau, which he thusly pocketed. Later that day the man of the house returned to find the money missing. The next morning the boy was arrested and placed in the county jail. Cook noted the exceptional callousness of the court proceedings for the impoverished orphan boy. [The judge] coldly, easily, and quickly sentenced that small thirteen year-old boy to a county ‘chain gang for three years and six months, at hard labor’. And this was the treatment meted out to a child in North Carolina Superior Court in 1890. The gross miscarriage of justice left an indelible mark upon Cook. He raised the issue in the court of public opinion by editorializing in newspapers about the dire need for a reformatory. Over the next 17 years Cook’s advocacy steadily changed the hearts and minds of North Carolina’s citizens. In 1907 the matter came before the General Assembly, which at the time hosted a number of former Confederate soldiers. At the last minute It was suggested to the bill’s authors that the school be named in honor of Confederate General Thomas J. “Stonewall” Jackson in order to curry their favor. On March 2, 1907 the bill authorizing the creation of the Stonewall Jackson Manual Training and Industrial School passed with all Confederate members voting in favor. 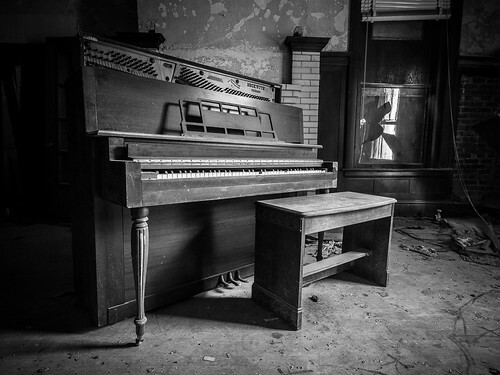 Photo: A silent piano sits the living room area of Cannon Memorial Hall. On the outset the foundation of the school teetered on the precipice of failure. The General Assembly only allocated a meager $10,000 to the project over a two year period. Unable to purchase a parcel of land adequate for the school, the Board of Trustees reached out to North Carolina communities. Citizens of Concord became interested in the project and raised another $10,000 to purchase a 288 acre tract of land in Cabarrus County. A generous $5,000 donation from the King’s Daughters and North Carolina Federation of Women’s Clubs enabled the construction of two cottages on the property. Construction costs for the first cottage exhausted funds to the point where it could not be properly outfitted. James Cook’s wife took it upon herself to rally local businesses and charitable individuals to donate furnishings and amenities. On January 12, 1909 the school housed its first students and staff in the newly completed King’s Daughters Cottage. Photo (source): Exterior plan of one of the colonial revival style cottages. Within a relatively short span of time the school was able to overcome its foundational hardships. Word spread throughout the state that the school had positive outcomes in turning the lives of boys around. As a result the campus rapidly expanded over the next three decades. State funds, support from surrounding counties, and private donations supported the construction of a total of 17 colonial revival style cottages. In 1922 the administration was thoroughly destroyed in a fire. In its stead rose the Cannon Memorial Memorial Hall on the north side of the property. By the 1940’s additional buildings included a gymnasium, pool, infirmary, bakery, laundry, print shop, and other smaller structures. The school also maintained a 984 acre farm to provide both food and financial support. Crops raised on the farm included tomatoes, cabbage, beans, corn and potatoes. A herd of Hereford cows and Berkshire hogs produced an ample supply of meat. 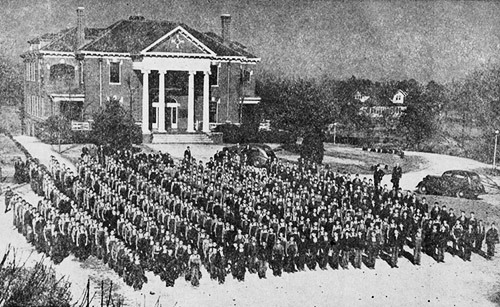 Photo (source): Students assembled in front of Cannon Hall. Development for boys at the school included a healthy mixture of academics and labor. For half of the day students were expected to work in some capacity on the premises. After a period of general adjustment, each student was assigned to learn a trade befitting his aptitude. Those not inclined to farm work were participated in industrial programs that taught shoemaking, barbering, textiles, and a mechanics. Some students also learned the print industry by producing a magazine called The Uplift. The other half of the day was spent in school, which operated year-round. 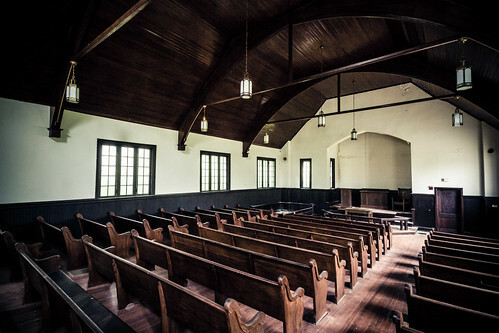 On Sundays all were expected to participate in Christian religious activities in the chapel. In the evening the boys returned to their respective cottages to their “father” and “mother.” The father was expected to oversee the boys at play, provide discipline, and counsel them as needed. The mother prepared meals, kept the cottage clean, and insured that the boys minded their manners. Although up to 30 boys occupied an individual cottage at any given time, the intentional family-like structure was meant to foster positive emotional and social development. Photo: The chapel was renovated in 1997 after a 15-year period of neglect, only to once again fall into disuse a few years later. Over the years the population dwindled as welfare programs expanded and social attitudes towards minor delinquency shifted. As enrollment fell the school ceased its untenable farming operations. Unoccupied cottages were sealed up and left to the elements. The makeup of the student population also changed, as the facility took in minors with more serious criminal offenses. A barb-wired fence now cordons off a 60 acre partition to prevent escape. Video (source): Historical Moments – Stonewall Jackson produced by Cabarrus County. 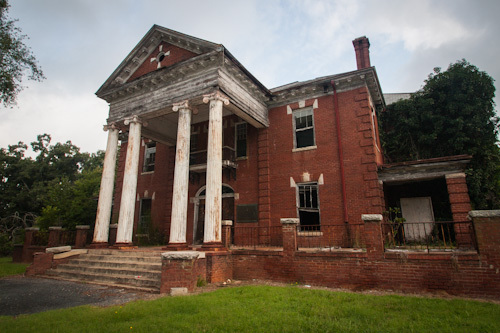 Although the site is in the National Register of Historic Places database, there is little public interest in preserving any of the buildings. As long as a portion of the site remains a correctional facility, the prospect that anyone would buy a refurbished cottage as a home is bleak. There are also not enough businesses in the local area to support commercial development. For the foreseeable future the school, once teeming with life, will continue to succumb to unrelenting natural forces of decay. Cabarrus County (PDF) – 2008 Central Area Plan detailing possible development. Chasing Carolina – A blog entry of a photographer’s exploration experience. Facebook – Group where people who attended the school share memories. Google Books – Has a photo of the cottages along with brief description of the school. Google Books – Discusses the influential roll women’s groups played in founding the school. Google Books – Description of the school’s role in educating troubled youth. HMdb.org – Historical marker information. Independent Tribune – 2009 article on the centennial celebration of the school. Internet Archive – Full Text of History of the Stonewall Jackson Manual Training and Industrial School (1946). Internet Archive – Full Text copies of The Uplift produced by the school. Journal Now – Article on the forced sterilization of six students. National Park Service – National Register of Historic Places entry. NCPedia – 2006 article on the beginning history of the school. 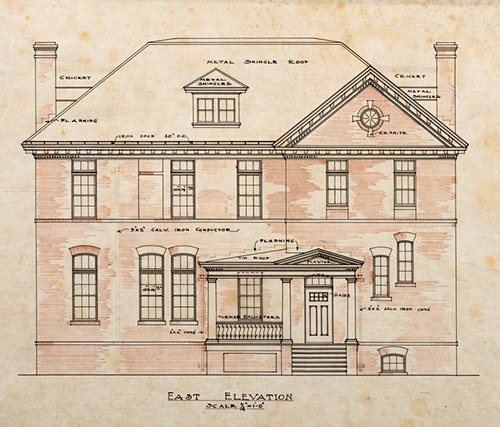 NCSU Digital Library – Photos and floor plans of school structures. NC Dept. of Cultural Resources – Summarized history of the location. NC Dept. of Public Safety – Describes early juvenile justice environment which created the school. Sterling E. Stevens – A blog entry of a photographer’s exploration experience. YouTube – Video highlighting the history of the school. Wikipedia – Article on Stonewall Jackson Youth Development Center. Wikipedia – Article on Stonewall Jackson. Central State Hospital in Indianapolis served the Indiana community for 146 years. Photo: A stadium doomed from the very beginning. Sports play a quintessential role in experiencing the American Dream. On the field, court, track, pool or rink is where our heroes are born. It is a place where even those coming from less than ideal circumstances can rise above their social station. These venues are secular churches to the American Dream: a place where people can congregate, worship the spectacle of conflict, and adore those with seemingly superhuman abilities. On the western edge of Gleason Park in Gary, Indiana is such a church. Concrete walls are collapsing around the narthex. Weeds grow unfettered in the sanctum of the football field. The roar of the crowd in the pews are not but the chirping of fleeting birds. With no gods to worship, the American Dream is essentially dead at Gilroy Stadium. In January, 1955 mayor Peter Mandich pushed the city council for the construction of a sports complex called the South Gleason Park Athletic Complex. Mandich promised the council that if costs exceeded their ability to pay that the project would go no further. The council decided to go forward with the construction of a stadium as the first element, funding construction to the tune of $350,000 in bonds. Several weeks later Mandich again appealed for funds to complete the stadium, stating “I’d much rather not build a stadium if we’re not going to build a decent one.” Throughout the bidding process city officials were given low-ball estimates to work with. Before long it was discovered that over $687,000 was already awarded to independent contractors. Cost overruns continued to loom as construction wrapped up in 1956 and the final bill amounted to $1 million dollars (or more than $8.5 million adjusted for inflation). Comparing the stadium to another sports facility of the era illustrates just how horrendous spending on the project had become. Built in 1957 at a cost of $940,000, Lambeau Field in Green Bay, WI used 11,000 tons of steel to complete an NFL calibre venue that could seat 32,000 fans. 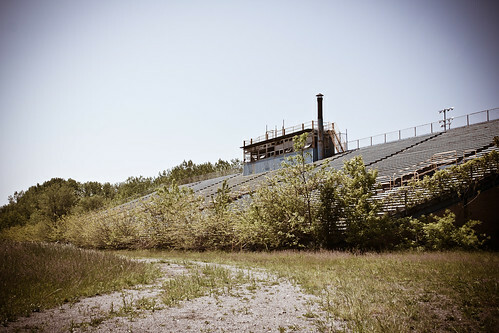 The stadium in Gary, built in a city that the steel industry defined, used a paltry 630 tons and could only seat 10,000. Citizens were understandably livid at having to foot the cost of a substandard facility. Plans to construct additional sports facilities for the South Gleason Park Athletic Complex came to a screeching halt. Despite the enormous amount of money poured into the football field several features were never finished. Bleachers, concession stands, and restroom facilities to accommodate 5,000 fans on the south side of the football field never materialized. Staff offices, maintenance facilities, and an additional locker room also never saw the light of day. Gravel for an eight lane running track surrounding the football field was laid down, but never actually paved. Photo: The press box has been cordoned off, but the field at large remains wide open. The stadium took its namesake from local citizen John F. “Jack” Gilroy. He had come to the area in 1911 and took a gym teacher position at Emerson High School. The affable Gilroy rose to become the city’s first athletic director four years later. By the time the stadium was complete, and Gilroy ready to retire, the venue was named in his honor. At the grand opening on September 1, 1956 all eight area high schools participated in Football-O-Rama exhibition games. By 1962 the façade that Mandich had enthusiastically pitched just a few years prior was beginning to literally fall apart. Building inspectors noted considerable cracking and moisture damage in the concrete supporting the bleachers. Scandal swirled around the field when federal investigation into six individuals involved with project were convicted for kickbacks and bribes during development. Nothing more than a coat of fresh paint was used to put the concerns about construction to rest. Photo (source): The Jackson 5 with Mayor Hatcher at Gilroy Stadium. Between 1963 and 1973 local schools found Gilroy facilities unable to meet their needs. Most decided that it was in their best interest to construct their own facilities instead of paying rental fees, which hastened the decline of Gilroy Stadium. As the number of sporting events precipitously dwindled, city officials populated the schedule with alternative events. During the annual talent search in 1965 an upstart family act called The Jackson 5 won with their performance of “Bearfootin’.” Their stunning performance garnered the group’s first notable media mention in the local Gary Post Tribune. The Jackson 5 would return to Gilroy Stadium again in 1968, but this time they were signed under the famed music label Motown Records. Over the next thirty years the languishing facility would only be used intermittently. Anecdotal evidence says that the scoreboard has not been lit since some point in the 1980s. Tower lights that went dark were no longer replaced. In 1994 concrete collapsed onto an electrical transformer, which knocked out power and lead to the cancellation of the Taste of Gary festival. Functional indoor plumbing only existed in the distant memories of those who knew the stadium in its prime. In between use weeds would consistently reclaim the surrounding area. Photo: Weeds growing over the concourse up to the bleachers. The beleaguered venue was again embroiled in controversy after the city granted the Ku Klux Klan the right to hold an event at the stadium in 2001. On the day of the gathering a crowd of protesters greatly outnumbered the 25 Klan members in attendance. It was reported that the protesters were able to drown out the hate speech by singing “We Shall Overcome” in unison. A vast majority of the events at the stadium have been significantly more benign in comparison. The field has been sporadically used for a variety of concerts, friendly competitions, and other public gatherings. Because the bleachers were wholly unfit public use a significantly smaller set was constructed to accomodate audiences. 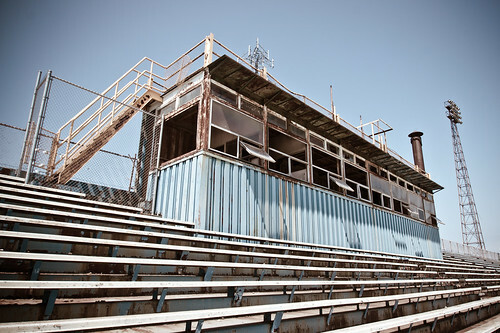 Although the stadium was worse for wear, the Gary Golden Bears semi-pro football team called it home for 15 years. In 2002 park department officials finally locked the gates and erected no trespassing signs around the perimeter fence. Curious explorers will find relatively little left behind at the barren stadium. Upper level concrete floors have begun to cave into the lower. Unlocked doors sway whenever the wind catches them right. The bleachers are faded white from a constant barrage of harsh sunlight. Vines have taken root and are working their way up with a level of patience only found in nature. Steel exposed to the elements has succumbed to relentless oxidation. On the north side a relatively new baseball diamond has been constructed, but even that has shows signs of neglect endemic to Gary. As with many other building proposals planned for Gary the future of Gilroy Stadium seems to hang perpetually in the balance. One proposal to construct a casino on the property has all but stalled. Another proposal includes donating the property to be the future site of a museum dedicated to the memory of Michael Jackson. In the absence of sporting gods to worship, it seems almost fitting that the land be dedicated to other American deities: money and celebrity. Google Books – The Jackson 5 perform a benefit concert at the stadium in 1968. Google Books – Two photos of people at Gilroy Stadium in its heyday. Google Books – Briefly mentions Gilroy Stadium in relation to the Jackson’s home. 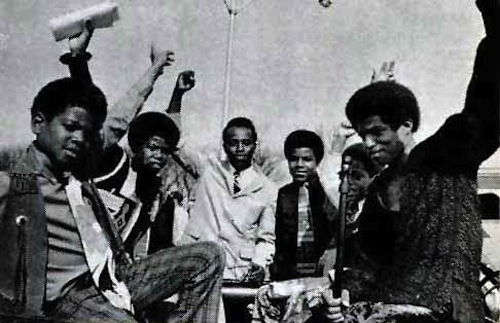 J5 Collector – Photo of The Jackson 5 during Gary’s Festival at the stadium in 1969. Post Tribune – 1996 article on the troubled history of Gilroy Stadium. Post Tribune – 2001 article comparing Gary, Indiana’s Gilroy Stadium to Lambeau Field in Green Bay, WI. Post Tribune – 2001 article detailing the Ku Klux Klan rally event and protest. Post Tribune – 2001 article citing the number of Ku Klux Klan members at the event. Post Tribune – 2002 article on the uncertain future of the stadium. Post Tribune – 2010 article on the details of a Michael Jackson museum. Post Tribune – 2011 article on the stalled Michael Jackson museum. Region Sports – An article on the rise and fall of Gilroy Stadium. Region Sports – Miscellaneous facts about Gilroy Stadium. The Jacksons – The Jackson 5 win an annual talent search at the stadium in 1965. 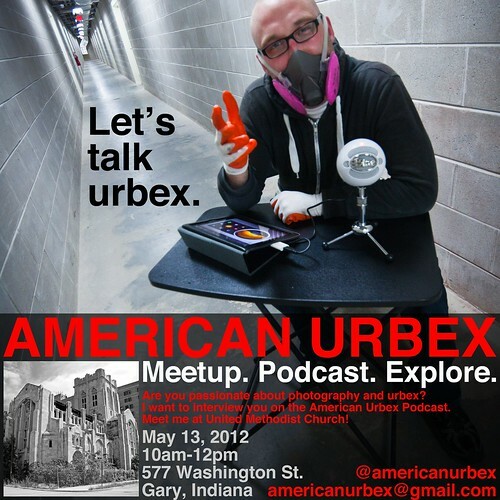 GERV talks about his urbex fascination, history in the graffiti scene, and other deep insights. Ryan Tretow shares his insights into Milwaukee architecture, urban exploration, and his approach to photography. Be sure to check out Ryan Tretow’s Flickr photostream. James Blücher (a.k.a. Filth City) responds to Jake Dillard’s question about urbexers who use film. Excellent photos James!